Last year, the NFC West was won by the Seattle Seahawks, who finished 7-9… When you don’t even need to be at .500 to win a division, you know that division is pretty damn terrible. Furthermore, the current playoff system let the 7-9 Seahawks into the playoffs, but not the 10-6 New York Giants… but I’m not bitter or anything… not one bit. I’m also not bitter that this could happen again this year and leave my Giants out of the playoffs again… or someone else… no, not bitter at all. On with the preview! Rama-lama-ding-dong. After three years of finishing with over ten losses, the Rams finally broke free and finished with only nine losses last year. Sadly, that was a huge step in the right direction for a franchise that was once known as “the Greatest Show on Turf.” This year, they’re finally gonna put it all together and finish above .500! In 2010, the Rams took Sam Bradford with the first overall pick because they knew that he could be the QB to lead them back to prominence for years to come. As a rookie, Bradford didn’t disappoint, putting up 3,510 yards and 18 touchdowns and leading the Rams to seven wins (a huge improvement over their one win the year before). Stephen Jackson returns as one of the elite running backs in the league (1,241 yards last season). The Rams added Mike Sims-Walker this off season, which should help Bradford a great deal. His other main target will be Brandon Gibson, with Donnie Avery remaining as the deep threat when Bradford feels like stretching the defense a little. The Ram’s defense was actually pretty decent as well last year, allowing 20.5 points per game. This isn’t astronimically good or anything, but it will do, as will their 40+ sacks and 34 turnovers. My Prediction: 9 wins, over .500 at least. Fantasy Notables: Sam Bradford, Stephen Jackson, Mike Sims-Walker.. pretty slim pickings, but Bradford and Jackson should provide well above average production. Fantasy Sleeper: I like Donnie Avery here. His deep ball potential could lead to some big games this season. Fantasy Poison: I wouldn’t get too high on the Tight End position here. I know it’s a slim pickings type of position, but who the hell is Brit Miller? 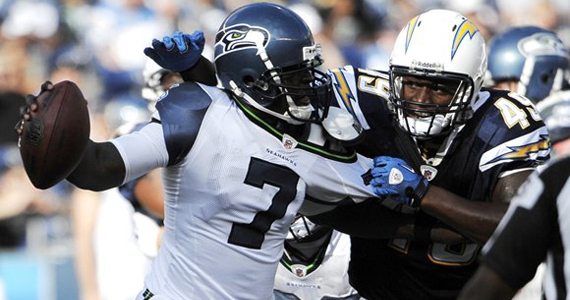 Can Tarvaris Jackson finally lead a team to success? Probably not. The Seahawks won seven games last year. It was enough to win the division… Thankfully, I don’t think this will be enough to win the West in 2011. The Seahawks have improved in some areas. Tarvaris Jackson finally has a team all to himself. This season will be his chance to finally prove to the world (and Minnesota) that he has what it takes to run an offense. The Seahawks also added a couple of weapons to help Jackson out, signing former Raiders TE Zach Miller and former Viking WR Sidney Rice (to go along with Mike Williams). Marshawn Lynch returns with his 1,000 yard talent as the starting RB after being acquired last season too. The Seahawks defense, much like everyone else in the division, is definitely a work in progress. Last year, the team gave up 25.2 points per game and only forced 27 turnovers. The defense won’t really help you much this season. My Prediction: 8 wins, .500 isn’t much, but it’s better than last season. Fantasy Notables: Marshawn Lynch (he’ll get the majority of touches at RB), Mike Williams, Sidney Rice, Zach Miller. Fantasy Sleepers: Tarvaris Jackson. He is a risky pick, but he finally has his chance to shine. I think he’ll be better than most expect. Fantasy Poison: Now that Matt Hasselbeck is gone, it’s not him. I’d stay away from the Defense here though. 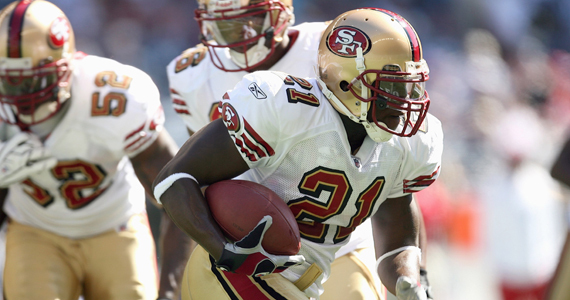 Frank Gore could be the key to setting up Alex Smith’s last chance at life in the NFL. Stay with me, this will all be over soon. The 49ers have some intriguing weapons on offense. Alex Smith isn’t one of them at all. However, he does bring some value if you need a spot start during a bye week, or maybe someone to mow your lawn in three years. If Smith can successfully hand the ball over to running back Frank Gore, this team will be able to sneak a few wins. Either way, Frank Gore is an elite running back in the NFL. If he can stay healthy (he very much did not last year), he has the potential to put up 1,200 yards and double digit touchdowns. Another way Smith could help this offense is to get the ball to Michael Crabtree. He has the size and speed to be an elite receiver in this league. Also, let’s not forget the 49ers also added troubled but talented receiver Braylon Edwards (formerly of the Jets). He could provide Alex Smith with the veteran deep ball presence they have lacked in recent years. Finally, Vernon Davis is one of the most talented TEs in the league. He has put up nearly 2,000 yards and twenty TDs the last two seasons. If the offensive line can give Smith the time needed to get the ball down field to his many weapons, the 49ers could make a splash this year. Defensively, the 49ers are nothing really special, although they did allow under 100 rushing yards per game last season. Jim Harbaugh’s new team will have to focus more on causing turnovers and pressuring the QB if they are going to really turn this franchise around. My Prediction: 7 Wins. Better than last year’s six, but still not good enough. Fantasy Sleepers: Alex Smith… this is literally his last chance to show that he can be a starting QB in this league. The front office has surrounded him with a lot of weapons. Now or never for Smith. Fantasy Poison: I wouldn’t expect too much from the defense, only because their pass D just isn’t up to snuff. Again, someone has to finish last in every division. Last year, you could have probably picked any of these four teams to finish last before the year got underway. This season, it’s looking more and more like it’s probably going to be the Cardinals. They really don’t have much going for them. The defense allowed 27.1 points per game last year, which was good for 30th in the league. What did they do to improve things this season? They lost one of their best defensive backs (Rodgers-Cromartie). On offense, there has been one major improvement. The QB situation last year was brutal for the Cardinals. For one, Derek Anderson started nine games. What the hell happened to that guy? Remember when he was good? The other games were started by a combination of Max Hall and John Skelton. It might as well have been Mel Hall and Red Skelton. Anyway, the Cards addressed this concern during the off-season by trading for Kevin Kolb. Kolb was no longer needed in Philly because of the re-emergence of Michael Vick, and the signing of the extremely troubled Vince Young to back up. Kolb has never really proven anything in an every day capacity, but it is generally believed that he could be a solid NFL QB. I have no reason to believe he won’t hold up his end of the bargain in Arizona. Luckily for Kolb, he’ll have one of the best WR in the NFL to throw to in Larry Fitzgerald. They just signed him to an eight year deal, so at least Cardinals fans will have something to look forward to. Beanie Wells isn’t going to be putting any butts in the seats, that’s for sure. 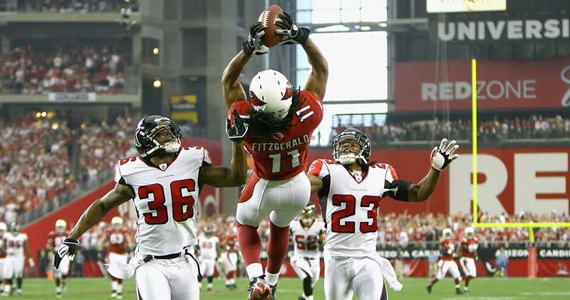 Fantasy Sleeper: When everyone double teams Larry Fitzgerald on every play, it could open up some opportunities for Early Doucet. Someone else has to catch the football. Fantasy Poison: Beanie Wells…. I don’t care. He’s never been good. and he never will be. Thank you.